There aren’t a lot of quiet places in New York City. So when I considered the building of a 9/11 Memorial on the site of the World Trade Center, I was skeptical. With the West Side Highway on one side, and Manhattan high rises, stores and construction on the other three, the Memorial seemed doomed. It would be swallowed up, a place where grief would be distracted by jackhammers, sirens and car horns. 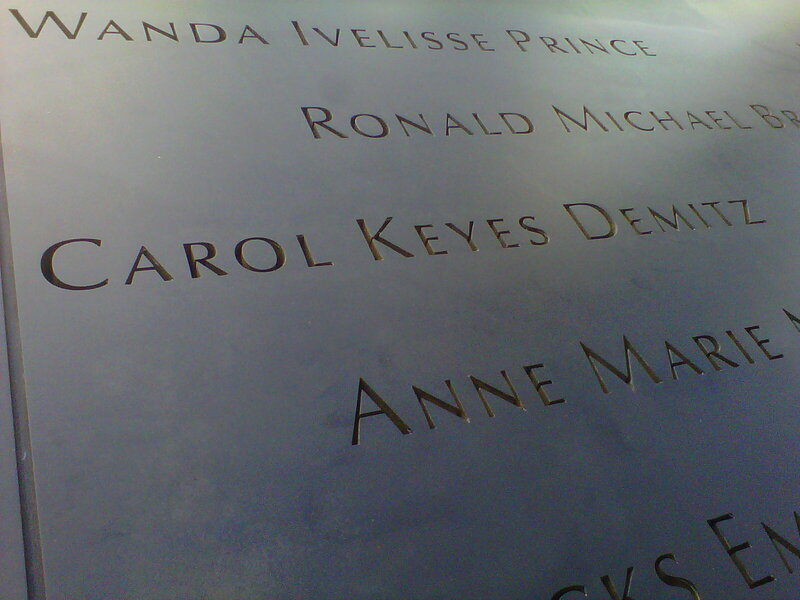 Yesterday I visited the new 9/11 Memorial. By now you’ve probably seen photos of the two waterfalls, in the footprints of the towers, and the futuristic building that will serve as the entrance to the Museum when it opens next year. The final design took years of arguing, negotiating and compromise. Michael Arad, the designer, was initially quite angry about changes suggested and finally made to his original design. But he has since agreed that the final product works. When you walk onto the site, you are greeted by wide walkways and occasional low, stone seating. There are rows of swamp oak trees, presumably hardy since they survived the recent hurricane. Off to one side is the “Survivor Tree”, a Callery Pear tree so named because it survived the attacks. For the past ten years, it has been lovingly nurtured back to life, and now stands apart from the other trees, protected by steel cables anchored into the ground. On this third day of the Memorial being open, the tree was already the recipient of gifts of flowers, prayer cards and a teddy bear. The two waterfalls are separated by the building that will house the entrance to the Museum. That building, as well as the trees, serves to separate the Memorial from the outside world, providing a buffer of security. Although construction on the four new towers will continue for another 2-3 years, when completed, those buffers will be even more important. I knew the waterfalls fell to 30 feet, but pictures do not convey the beauty and power of this design. It’s deceptively simple, but elegant in its way. Unbeknownst to the designers, when the light hits the waterfall at a certain time of day (not when I was there), rainbows appear, a fitting tribute, don’t you think? When you stand there, you really are not distracted by noises or sights. Imagine the Vietnam Memorial in Washington being plunked down in the middle of DuPont Circle. It would give you a completely different - and not good - experience. But this works well. There are Memorial staff walking around, available to answer questions and direct visitors to the kiosks where you can look up names and locations. They also have materials to use - free - to make rubbings of the names. A high school classmate of mine died in the south tower, and I wanted to make a rubbing to give to our school. The paper they provide is not regular paper; it’s more like fabric, soft and pliant. You’re given three long pieces, along with a thick, black crayon. My friend and I carefully made two rubbings, and used the third piece to wrap them. I don’t think you get a sense of the number of names, like you do at the Wall. But you definitely get a sense of the size of the hole - literally and figuratively - that was left by the attack. We can only hope that the area remains as un-commercialized as it is now. I assume any “gift shop” will be inside the Museum, and out of site of the Memorial. 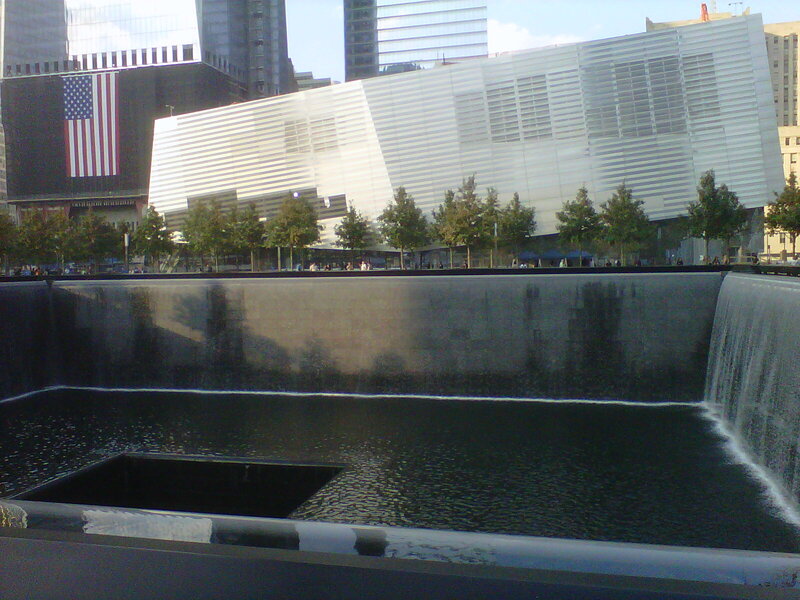 Like any cemetery or memorial, the 9/11 Memorial can evoke strong reactions. My friend said he felt nauseous when we first arrived, remembering that almost 3,000 people died on that spot. I felt nervous and tense. I warned him ahead of time that he could expect me to cry, and I did: not just for Carol, not just for the others who died, but for all of us who lost their innocence that day. Don’t take my word for it: see it for yourself. Beautifully written. I'm tearing up just reading your written tribute. Thanks for sharing - I'd definitely like to go, someday. It sounds beautiful. Thanks, Beverly. You, too, Pat: high praise and I appreciate it! Hello Victoria. I have visited your blog before, as you know. But I was prompted to leave a comment by visiting here from She Writes. Thanks for your lovely post. I appreciate your impressions of the Memorial. I was there Nov. 11, 2001, when the jagged ruins were still smoking. There were small groups of people crying and praying and emotion around the site was palpable. I'd love to go ten years later. I like your words about all us losing our innocence that day. There's a lot of truth it that. Thanks Helen and Carol for stopping by. I've been to Ground Zero a number of times since 2005, and it was, sadly, just a construction site to me. I didn't feel anything. This was like stepping into another world, almost. I look forward to seeing it again. Stopped by on the blog hop. I'm a long way from New York and may never see the memorial, but you got the sounds and feeling TV programs don't. Thanks for the comment and reminder, Shelley. I'm going back to NYC in November and I think I'd like to go back again. Now and then I take a good picture. I got lucky! Oh, Victoria, your writing filled my heart. 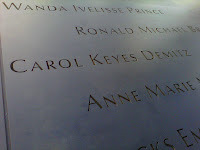 I stopped by from SheWrites, and when I read your piece on the 9/11 Memorial, I had to join your blog. The part about "the rainbow at a certain time of day" put a lump in my throat. Next Thursday, I will be visiting the "Traveling Wall," a tribute to those lost in the Vietnam War, in Santa Barbara. My husband was a Vietnam vet who suffered with PTSD for 15 years before he took his own life. I wrote a book from my diary showing the love and life we lived. My blog is my journey into publishing this book. I wonder how seeing the "Wall" will affect me. I hope to blog about the experience. Thank you for caring so much for others . . .
Nancy - I'm glad you liked this. I was hoping I would be there to see the rainbow, but I wasn't. Maybe next time. The Wall was very emotional for me; two guys I grew up with are on it. And it must be much more so for you. Best of luck on your book. I'm following your blog now, too!